Vulcan is the Roman and Greek god of fire and the forge, and mythical inventor of smithing and metal working. His Greek equivalent is Hephaestus. His forges were under Mount Aetna on the island of Sicily. He was smith, architect, armorer, chariot builder and artist of all work in Olympus--dwelling place of the gods. Vulcan is the son of Jupiter (Zeus) and Juno (Hera), husband of Venus (Aphrodite) and is considered to be one of the twelve Olympians. With the help of Cyclops, the one-eyed giant, he made the thunderbolts of Zeus, the weapons of Hercules, and the armor of Achilles. 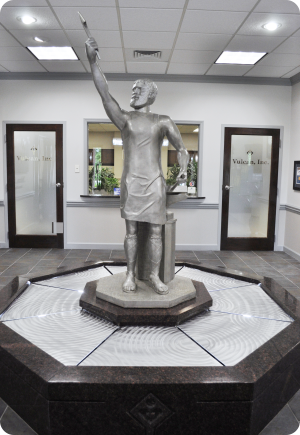 Vulcan is symbolic of the metal industry, and is particularly appropriate for our company as melters, casters, rollers and fabricators of metal.